Two years ago, in the summer of 2006, I attended my first training class taught by MSG Paul Howe, USA Retired. Howe taught proper rifle shooting positions, transition drills, and laid out a baseline of skillsets that every rifleman should be able to perform on demand. Howe expertly taught the fundamentals of basic rifle shooting in addition to briefing the class on weapon maintenance, gear placement and preparing for medical emergencies. I took so much away from the class, that I immediately started looking forward to my next training class with Howe. In 2006, Paul Howe operated under Triple Canopy’s training division, but now he is on his own and works out of his CSAT (Combat Shooting and Tactics) facility in Nacogdoches, TX. The CSAT facility has on-site lodging for up to 24 students, a classroom, and an extensive range facility. Instructor Paul Howe pictured with the author. 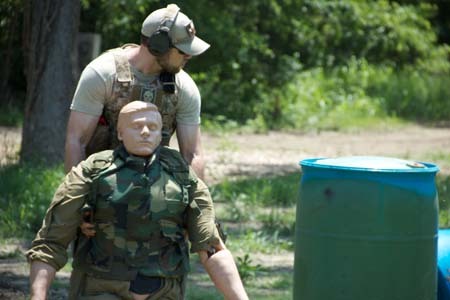 Lone Star Medics put on its 2-Day Medicine X Class at Quail Creek Shooting Range this weekend. 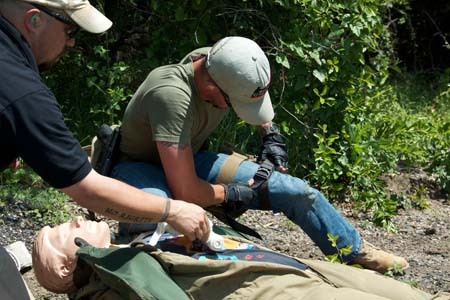 This “medicine under fire” class features classroom instruction and scenario based live-fire drills where students have the opportunity to put what they have learned into action under the stress of simulated real-world situations. 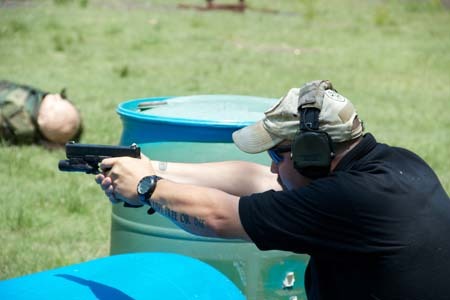 The event was hosted by ITS Tactical and co-sponsored by Lone Star Amory and XS Sights. Above, instructor Andrew Brady demonstrates one possible solution to a problem presented class participants. Your buddy “Randy” , seen prostrate in the background, has been injured during a violent robbery. What do you do? After neutralizing the immediate threats, ITS Tactical’s Bryan Black drags Randy off the “X” and behind cover. A momentary lapse in tactical awareness earns this student a penalty, a gunshot wound to his left calf. Now he has two patients, Randy and himself. Books and videos are great tools for learning but nothing can replace hands on adrenalin-packed live training, And just as important as the getting-your-hands-dirty part is the critical eye of an experienced “been there” instructor and the after action debrief. For more information on classes contact Caleb Causey at Lone Star Medics. See more photos and info at ITStactical.com. Combat Shooting and Tactics Scrambler drill. 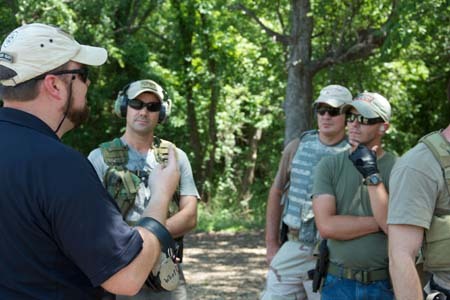 Conceal and Carry School takes place at TacPro Shooting Center in Texas and is sponsored by Ruger Firearms. The show airs Saturdays on SPIKE TV. MOTIVATION: When losing a limb can’t stop you from accomplishing your mission. Trident Training Group is committed to providing private citizens, corporations and government agencies with the tools they need to navigate life safely and effectively while maximizing physical potential. Our leadership and cadre’s experience and backgrounds range from U.S. Navy SEALs, Army Rangers, U.S. Marine Corps and several Federal Law Enforcement Agencies. At Trident we incorporate realistic training scenarios and use the most up to date tactics and techniques preformed by operators in the field. It is our goal to enable our clients to achieve their personal goals in fitness and personal defense. With our unique facilities and cadre, we work together with our clients to ensure they accomplish their next level of performance. IntelliQuest Training Academy is presenting a 5 day Executive Protection Course for today’s operators. This course is based on real world scenarios that incorporates appropriate training taking into account that most civilian executive protection teams actually consist of no more than 2 operators and maybe a professional driver on the detail at one time. Firearms training for civilians, law enforcement and military. American Shooting Centers provides a large area near Houston for recreational shooters. 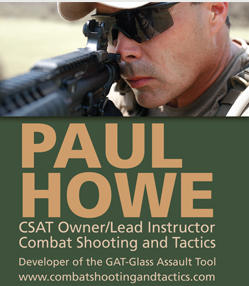 Owned and operated by Paul Howe, Developer of the CSAT AR rear sight and the GAT Glass Assault Tool. 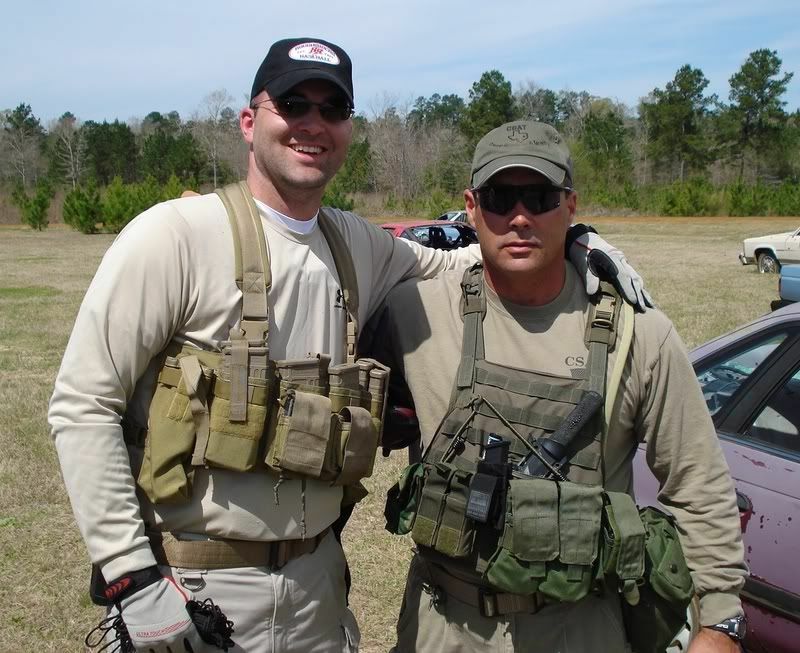 Author of Leadership And Training For The Fight: A Few Thoughs On Leadership And Training From A Former Special Operations Soldier and The Tactical Trainer: A Few Thoughts On Training And Training Management From A Former Special Operations Soldier . MSG Paul Howe demonstrating the CSAT AR rear sight and the GAT Glass Assualt Tool at his school in Texas.